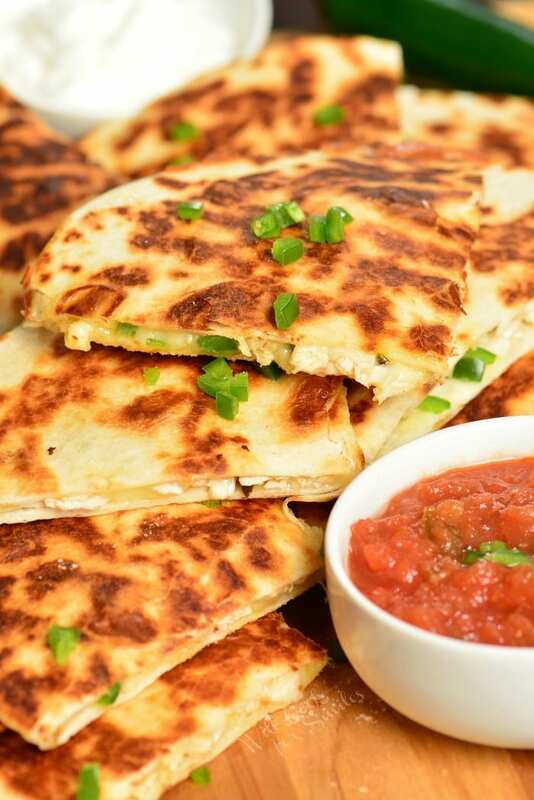 Spicy Chicken Quesadillas are easily made with only 4 ingredients and within 30 minutes. These Quesadillas are packed with melted cheese, tender rotisserie chicken, and spicy jalapenos, all stuffed in a crunchy flour tortilla. 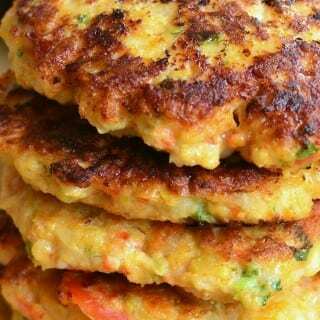 You can serve them as a snack, lunch, or make a big batch for a party. 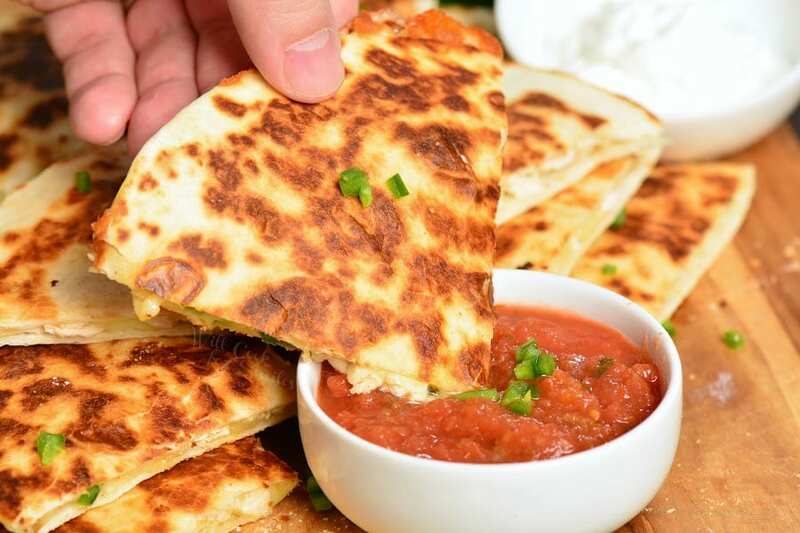 If you’ve never tried it, quesadillas are awesome dipped in Queso Dip. 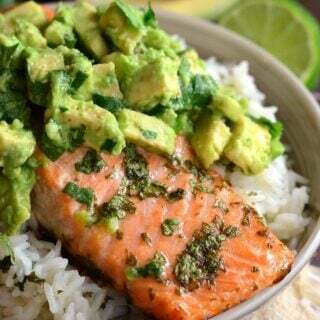 Make sure to also make some awesome Guacamole to go along with the quesadillas. It’s very hard to resist anything that’s loaded with melted cheese. Cheese just makes everything better and taste delicious. 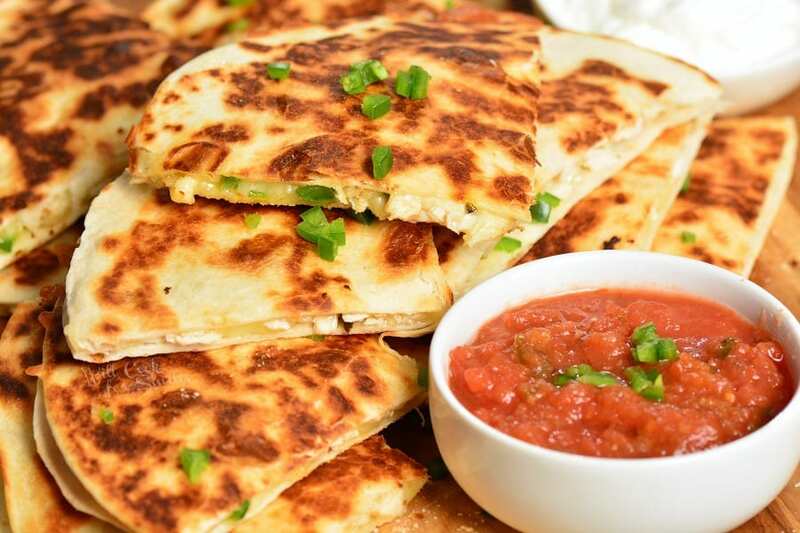 Luckily, these quesadillas are loaded with spicy Pepper Jack cheese. These quesadillas are super easy to put together since all you need is rotisserie chicken, jalapeno peppers, and Pepper Jack cheese to make the filling. 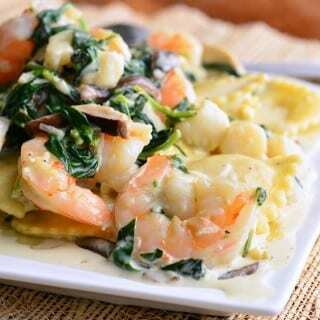 This simple combination of flavors is perfect together. There is a spicy bite from jalapeno peppers but chicken and cheese mellows the spice. You can make these quesadillas spicier by keeping the seeds in the jalapenos. Seeds are actually the spiciest part of the pepper so leaving them in, will kick up the spice lever quite a bit. When working with jalapenos and other spicy peppers, I highly recommend wearing gloves. Spice stays of your fingers for a long time, even after washing hands several times. I’ve tried many “tricks” that supposed to take off the spice but none of them ever truly work. It’s very easy to pick up a pack of latex gloves at the pharmacy and keep them in the kitchen to use when working with spicy peppers. Cut spicy peppers last, that way you don’t have to use the knife or the board again. If you can’t cut peppers last, switch to another cutting board after peppers are cut. Quesadillas are perfect to feed a crowd and if you’re making them one at a time, you will end up with most quesadillas being cold. 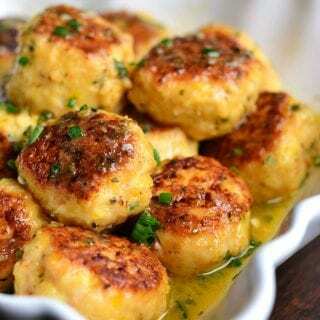 Keep cooked ones warm in the oven at 200° while preparing the rest. Use a pancake griddle to easily prepare several quesadillas at a time. 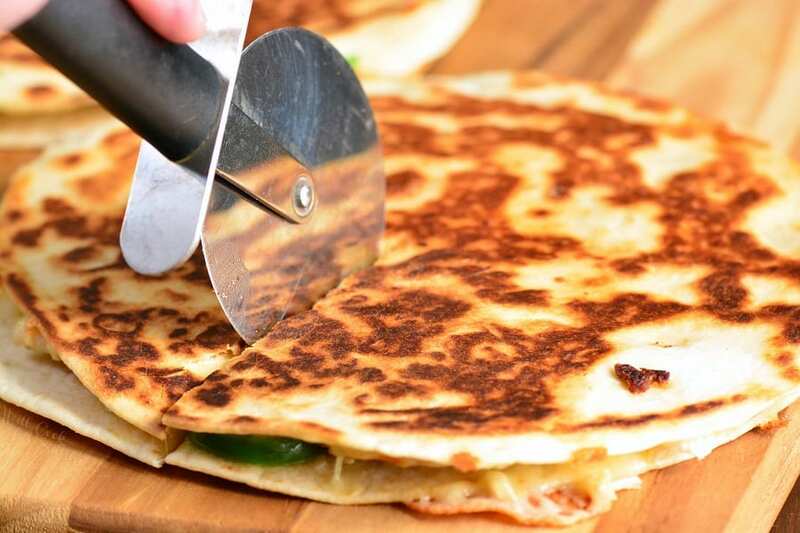 To easily and quickly cut quesadillas, use a pizza cutter. Absolutely! You can easily reheat quesadilla in a preheated pan, over medium heat. Place cooked quesadillas in a lightly greased pan and cook them on both sides just until the cheese is soft and melted again. This will “revive” the quesadilla and get the tortilla crispy again. 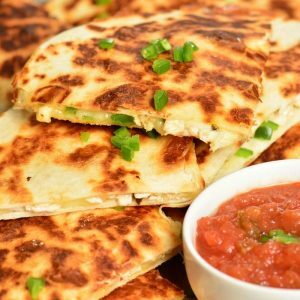 Gooey, cheesy, spicy chicken quesadillas made with 4 easy ingredients. Dice rotisserie chicken, grate cheese, and dice jalapeno peppers. (You can choose to discard jalapeno seeds or leave them in to make it spicier.) 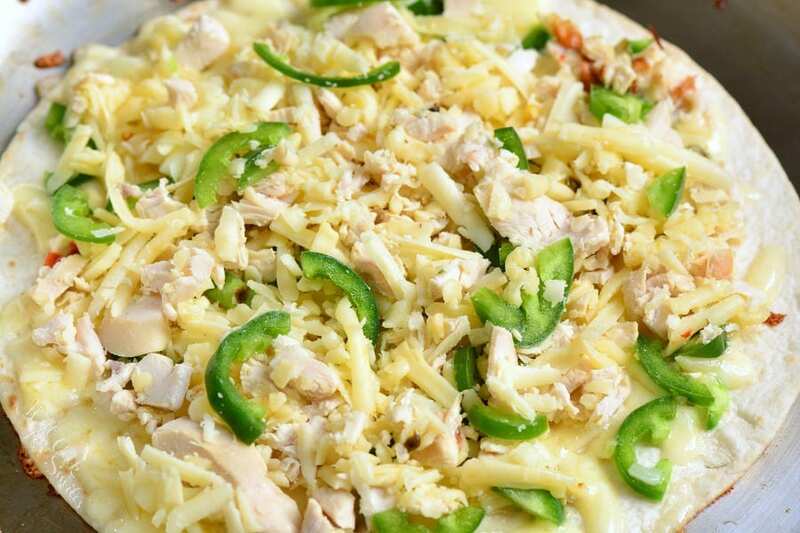 Combine chicken, cheese and jalapenos in a mixing bowl and mix until evenly mixed throughout. 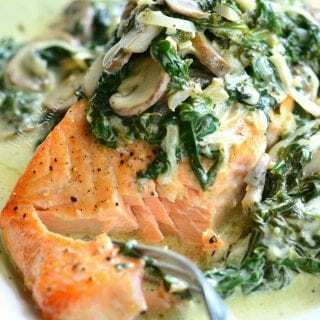 Preheat a cooking pan over medium heat and grease it lightly with some cooking spray. Place 1 tortilla in the cooking pan and spread a third of the filling all over the tortilla. Cover with another tortilla and and spray the top with some cooking spray. 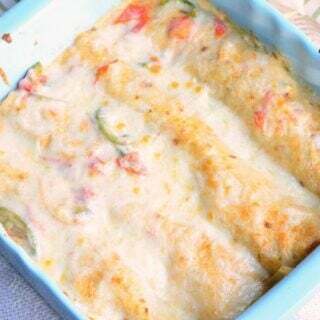 Cook until cheese starts to melt and bottom tortilla is browned. Flip on the other side and cook until that side is browned as well. Note: if available, you can cook more than one quesadilla at a time on a griddle. Note: you can keep cooked tortillas warm in the oven heated to 200°.